Jennifer Carroll is a graduate of the inaugural year of the Canadore College Theatre Arts program in North Bay, Ontario. Upon graduation Jennifer moved to Dublin to live and work abroad as an actor, producer, writer and stage manager. She most enjoyed working with theatre companies focused on developing new, original work from young Irish writers, including numerous productions for found-space company Come As Soon As You Hear, Broken Doll Productions, and The Talisman Theatre Company. Her focus dramaturgy and workshop production has informed much of her theatre career to date. 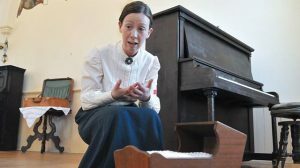 She has spent seven years touring an original one-woman show for the Lucy Maud Montgomery Society of Ontario around Ontario and the Maritimes entitled Maud of Leaskdale, chronicling 15 years of the famed author’s life. Jennifer is also a stage manager and producer, stage managing productions such as Her, Witless, and most recently King Lear for Watershed Shakespeare Collective, which she also produced. Jennifer is producing and co-directing Proscenium Club’s most recent show, Sit, James. Previous credits with Proscenium Club include The Life and Death of John the Milkman, in which she also appeared on stage as Shirley Harrison.